In the recent past, link building has drastically changed . With Google’s Panda and Penguin updates coming on the scene and more algorithm changes on the way, link building efforts must be undertaken with great care to avoid hamstringing your website with low quality links. Quality of links matter just as much, if not more, than quantity. Low quality links can devalue your site by connecting you to sites with unnatural link profiles. Putting together a campaign built on high quality links is less a numbers driven science and more of an art form in today’s web-verse. We consider ourselves linking artists, staying up-to-date on search engine changes to continually improve our link building services. We focus on building high quality, natural links back to your website, and do not take shortcuts like going after paid links. Bought links may be fast to accrue, but could frowned upon by search engines. Google’s Webmaster Tools provide valuable information on linking schemes to avoid. In general, sites that are high on ads & poor content and low on traffic & link moderation are red flags. Devaluation associated with linking to these will ultimately raise your long-term online marketing expenditures and reduce your ROI. The number of links you have is not important; the value that each of those links brings to your site is the key. For example, ten links from authoritative websites are worth more to your SEO rankings than 100 directory listings or non-authoritative websites. We’ve all grimaced after landing on an irrelevant, content farm, spammy, ad-filled site. This is the type of site you want to avoid linking up with. Major search engines track the number of incoming links to a website to determine the website’s popularity. If other sites are linking to you, this is like getting a “vote” from the other website. A corresponding page rank determines the website’s status which affects search engine rankings. Our link building services involve finding and establishing partnerships through link submissions to generate strong link popularity and page rank. We find industry related (but noncompetitive) websites that will welcome your URL to their website, thus boosting page rank. A high page rank does not guarantee higher search engine rankings. However, it is a good indicator of your site’s importance with Google, and will normally help make an already well on-page optimized site out rank a non-optimized site. When looking for links for our clients’ sites, we follow best practices and build links. We do not pay for them. We generate a variety of links from diverse and trust-worthy sources. This ensures that the link building strategy is natural, effective and long withstanding. Our strategies do not shoot for hundreds of one-way backlinks. Rather, we do our homework to get you the most valuable links possible for your industry. Clients come to us with different scenarios surrounding their link building needs. Some have in-house resources to dedicate to link building, but need some guidance on where to start. Others are just launching a new website, or are looking to add new life to an established website. Whatever your situation, we can develop a link building strategy customized for your business needs. We will work with your team to create a solid link building strategy that is organic and natural, and most importantly, also withstands search engine algorithm updates. If you are just getting started with SEO, we highly recommend our SEO audit services and on-page optimization before starting link building. 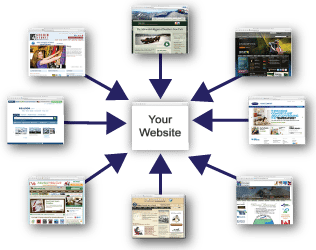 This helps to ensure that your website has a solid foundation for us to drive traffic to. Building links to a website that isn’t properly optimized is worse than not doing link building at all.